Top 1% of Indians own 58% of wealth in India, according to a recent report by Oxfam as published by Wall Street Journal. 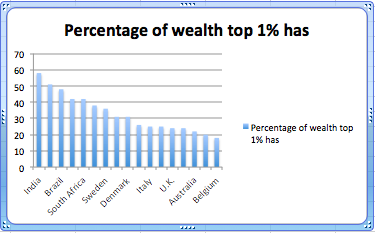 The report said the global average for wealth ownership of the top 1% is 51%. The income and wealth concentration in the hands of the richest top 1% skews the average per capita incomes and makes the material well-being of average citizen look better than it is. The best way to measure how well or poorly an average citizen is doing is to look at the median income and wealth, not the average or mean. The median income reflects how much the person at the 50th percentile of the income distribution earns, giving us a better picture of the well-being of a “typical” individual in a given country. Similarly, median wealth represents how much wealth a person at the 50th percentile of the wealth distribution has accumulated. It shows that India's urban median income is slightly higher than Pakistan's median income. However, India's rural median income is significantly lower than Pakistan's. It should be noted that 70% of India's population lives in rural areas, much higher than Pakistan's 61%, according to the World Bank. Using India's Census figures of 30% urban and 70% rural population, the median per capita income for all of India works out to $1,040.25, about 15.8% lower than Pakistan's median per capita income of $1,204.50. Median per capita income in Pakistan is 15.8% higher than in India, according to the World Bank PovcalNet figures. 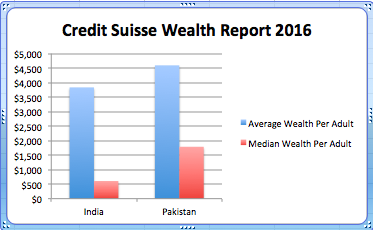 Median per capita wealth in Pakistan in Pakistan is 120% more than in India, according to Credit Suisse Global Wealth Report 2016. The median figures reflect the financial situation of the people at the 50th percentile of the income and wealth distributions in each country. The income and wealth concentration in the hands of the richest top 1% skews the average per capita incomes and makes the material well-being of average citizen look better than it is. The best way to measure how well or poorly an average citizen is doing is to look at the median income and wealth, not the average or mean. Median income and wealth figures in South Asia show that average Pakistanis are better off economically than their counterparts in India. Neal: "The flaws become very apparent if you look at the full report and its results rather than tunnel visioning into two countries "
I have quoted data from at least 3 different reports issued by three different organizations: Credit Suisse, Oxfam and the Center for Global Development, research wing of the World Bank. Which report do you have a problem with? Or do you dislike any report that reflects poorly on India? Yet Indians are expected to live longer, half their babies die in their 1st year compared to Pakistan and incidence of malnourishment and child stunting is much lower in India. If you read up on how disjointed and haphazard income data is gathered in developing countries compared to health and literacy data, you would understand better why this strange discrepancy exists. Neal: "Yet Indians are expected to live longer, half their babies die in their 1st year compared to Pakistan and incidence of malnourishment and child stunting is much lower in India." I guess your poor education prevents from understanding the difference between average and median. Average is skewed by a few high data points but the median reflects the mid-point which divides populations in two halves. In this scenario, the average income does not give us a correct picture. Further, it is safe to say, that the income of the average Indian is lower than the average income of India. Hence, the median income is the income of the average Indian. Given this, the median income is the right representation of the income of the average Indian. This is because the rich outliers (the Ambanis, the Adnanis, the Tatas and the Birlas) are taken into account. Data from World Bank shows that the top 10 percent of India’s population makes 30 percent of the total income. And this pushes up the per capita income." The problem of wealth inequality is much worse in societies that have intense social stratification, and less so in more homogeneous societies. Pakistan is an example of the latter, while India is the preeminent example of the former. The intense discrimination against Dalits, Muslims, and other lower castes creates a deeply unequal economy, hence a much lower median income. Nayyer Ali: " The problem of wealth inequality is much worse in societies that have intense social stratification"
A 2011 World Bank report titled "Perspectives on poverty in India : stylized facts from survey data"
Similarly, the scheduled tribes are also referred to as the Adivasis. .... we use the terms SC and ST, as these are standard administrative and survey categories. In the text we use the terms Dalits and Adivasis or tribals interchangeably with SCs and STs, respectively. Mayraj: " What Oxfam’s misleading stat gets wrong about inequality"
Credit Suisse Global Wealth Report 2016 puts the wealth of India's top 1% at 58.4%, pretty close to what Oxfam does. The share of the top 1% is up from 53% last year. In the last two years, the share of the top 1% has increased at a cracking pace, from 49% in 2014 (when Modi became PM) to 58.4% in 2016. While India has higher per capita income than Pakistan, why is the median income lower? I’m not familiar with data on the distribution of income in India or Pakistan. The distributional data I know come from household surveys on consumption expenditure: India’s National Sample Survey and the Pakistan Social and Living Standards Survey. Both countries conducted surveys in 2011-2012, so that’s probably the best point comparison. Based on those survey data, as summarized in the World Bank’s PovcalNet data set, both the mean and the median of household survey consumption per capita were higher in Pakistan than in India in 2011-2012. The estimated median consumption figure for India is computed as a weighted average of the urban and rural medians, based on population. According to these data, mean consumption per capita in India was about 89% of that in Pakistan, while median consumption was about 86%. Stated differently, median consumption in India was 77.8% of mean consumption, while in Pakistan the ratio was 80.4%. The fact that India’s median is proportionally lower than its mean reflects the somewhat higher degree of inequality in India, as reflected in the Gini coefficients: 35.2 in India versus 30.9 in Pakistan. If there are data that show that India’s mean income is higher but median income is lower than in Pakistan, that would also reflect the higher degree of inequality in India. At this point you might be wondering, how could Pakistan have higher mean consumption than India, when its GDP per capita is well below India’s when measured at PPP? (India $5,730 versus Pakistan $4,701, both figures from 2015.) The answer is that India has a much higher savings rate: 29.8% versus 9.0% in Pakistan. That higher savings rate helps fuel India’s faster growth rate, but leaves less for current household consumption. As a result, household living standards in India currently trail those in Pakistan, but are growing at a much higher rate and will soon overtake those in Pakistan. I am amazed at efforts by Pakistanis to prove that avg pakistanis is richer than Indian. If that is the case, how come in sales of all middle class aspirational items like car, air travel, iphones, ipads, India is far ahead of Pakistan. MNCs make a bee line for india for sales to its millions of middle class, not rich. After all how many cars can the same rich buy again and again. My theory is that Pakistanis believe in this to cover up their failures and indulge in feel good. As Ghalib said it "khayal acha hai"
For Pakistanis: The world is moving towards judging an economy not by GDP numbers (which can be easily fudged), but by micro indicators like car sales, travel business etc. I believe every country fudges its numbers, with China probably right at top. In those indicators Pakistan is quite poor. That does not mean things can not change in future. RK: " For Pakistanis: The world is moving towards judging an economy not by GDP numbers (which can be easily fudged), but by micro indicators like car sales, travel business etc. I believe every country fudges its numbers, with China probably right at top." Talking about fudging, world's top economists including India's ex Central Banker believe Modi is fudging India's GDP. You are wrong to talk about shift to micro indicators like car sales, business travel as the new trend. The biggest issue right now facing policymakers, business executives and economists is growing inequality that my post addresses. "Give me a point of view and I can surely back it up with a statistic." You have to look at education, health, economic opportunity and such factors in addition to income to make a true assessment. JC: "You have to look at education, health, economic opportunity and such factors in addition to income to make a true assessment. " There are indicators that do that. 1. Inclusive Development Index (IDI) on which Pakistan ranks 56 , well above India at 60, among 79 developing economies. Inclusive Development Index (IDI) is based on 12 performance indicators. In order to provide a more complete measure of economic development than GDP growth alone, the index has three pillars -- Growth and Development, Inclusion and Intergenerational Equity, and Sustainability. 2. Multidimensional Poverty on which Pakistan does better than India in South Asia. Pakistan’s per capita income has marginally grown to $1,561 but targets to increase investment and savings – the two most critical economic indicators after national output goal – have been missed again during the outgoing fiscal year. The government’s inability to increase investment as percentage of total size of national economy is probably the biggest failure after it failed to achieve outgoing fiscal year’s gross domestic product (GDP) target of 5.5%. Missing of the targets on savings, investment and GDP growth also puts a question mark over the acclaimed structural reforms introduced under the $6.2 billion International Monetary Fund bailout package. Pakistan has one of the lowest investment and savings rates in the region and the world, obstructing progress towards a sustainable and inclusive economic growth path. Slow progress on the China-Pakistan Economic Corridor due to lack of political vision and usual bureaucratic inefficiency also pulled back investments. Sources said in dollar terms the per capita income has grown by only 2.9% to $1,561 – up $44 in the outgoing fiscal year 2015-16. Despite a marginal increase in per capita income, the country continues to be in the league of low middle-income countries. It needs to enhance per capita income to $4,000 to be labelled a middle-income country. In rupee terms, there was a 5.8% growth in per capita income that increased to Rs162,568. To arrive at the per capita income figure, the Pakistan Bureau of Statistics – the government’s statistical arm – estimated about 2% growth in the country’s population that reached 193.56 million this year. It then divided the total national income with the number of people and arrived at per capita income of $1,561. In absolute terms, the PBS has estimated addition of about five million people in a single year. Like the previous year, in the current fiscal year too the federal government has again failed to deliver on the two most critical economic indicators. It missed the targets of investment and savings with wide margins. The investment-to-GDP ratio slipped to 15.2% against the target of 17.7%, said the sources. The ratio was lower than last year’s revised rate of 15.5%. Savings remained almost stagnant at 14.5% of GDP, shy of the target of 16.8%. Reports prepared by the World Bank (WB) have revealed that the per capita income of Indians is often more than the per capita income of the average Pakistani. Using the globally accepted Purchasing Power Parity or PPP method to analyze and compare the per-capita income of various nations, reports prepared by the World Bank found that every Indian earns around USD 5,630, while a Pakistani earns around USD 5,090. A closer look at the statistical evidence provided in these WB reports reveals that one U.S. dollar is equal Pakistani Rupees 10.4.56, while one U.S. dollar is equivalent to Indian Rs.67, and therefore, an Indian earns 54,000 Pakistani rupees more than his Pakistani counterpart or Indian Rs 36,100 more than what a Pakistani individual earns in a year. Even if we forget the statistics, every foreign writer who has visited India and Pakistan has come to the same conclusion that the poverty level in Pakistan is much lower than in India. To me, the funny part is that both countries are only above Sub-Saharan Africa in the UN-HDI index but are always trying to show that we are better than the other. 2016 has proved one thing, India is irrelevant for Pakistan. We should put our house in order and ignore India totally. Because savings/gdp and investment/gdp and tax receipts/gdp is 2X+ of Pakistan.PAkistan is financing current consumption at the expense of future capacity. Also the vast bulk of Indian investment is domesticaly financed 600 billion vs 50 billion FDI thus immune to foreign exchange risk. In Pakistan not only is the investment financed from abroad CPEC etc but even the government functioning is dependent on foreign aid. These are facts which cannot wished away. India is on a completely different league/trajectory than Pakistan. Anon: "India is on a completely different league/trajectory than Pakistan"
India is enriching a few at the expense of many. The share of the top 1% is up from 53% last year. In the last two years, the share of the top 1% has increased at a cracking pace, from 49% in 2014 (when Modi became PM) to 58.4% in 2016. India is the poster child of unequal development as measured by Inclusive Development Index. India's median per capita income of $1,040 (vs Pakistan's $1,204) is much less than the average per capita income $5,700 (versus Pakistan's $4,811). "These are facts which cannot wished away." Please tell that to the millions of people in India who commit suicide every year. I am sure that would be happy to hear that their children may not have anything to eat or drink, have no hope for the future and they may have to commit suicide tomorrow, but at least their country has less foreign debt. Or maybe they don't count because after all they are from lower casts. When we look at statistics, why do we ignore the fact the India's suicide rate is 10 time higher than Pakistan? The poverty level in Pakistan is lower, the middle class is bigger. The mere fact that Indians get so upset whenever facts are mentioned is proof that all is not well in the lala land. The automotive industry in India is one of the largest in the world with an annual production of 23.96 million vehicles in FY 2015-16. The automobile industry accounts for 7.1 per cent of the country's gross domestic product (GDP). The Two Wheelers segment, with 81 per cent market share or 19.4 million vehicles, is the leader of the Indian Automobile market, owing to a growing middle class and a young population. Question: If not the middle class, who is buying these vehicles? (In comparison, Pakistan automotive industry is 11.98 times smaller with annual production of 200,000 motor vehicles and 1.8 million two wheelers). Jyotsna S, MBA: "Question: If not the middle class, who is buying these vehicles?" Vehicle ownership rate in both India and Pakistan is extremely low at 18 per 1000 persons that translates into 1.8%. Do you think these 1.8% represent middle class in either country? I don't think so. Suresh: "I think the scooter/motor bike sales are made by middle class." In spite of the fact that the motorcycles are driven almost exclusively by men in Pakistan, 43% of Pakistanis report owning a motorcycle, according to Pew, petty close to 47% of Indians reporting owning a motorcycle. Riaz Haq, please stop polluting the India minds with facts. Remember this is the nation that was using aeroplanes thousands of years and were travelling intergalacticaly? India is the second most unequal economy in the world, according to an Oxfam report released recently at the World Economic Forum. Oxfam India CEO Nisha Agrawal tells Himanshi Dhawan that demonetisation has only aggravated this inequality with no significant long-term benefits. 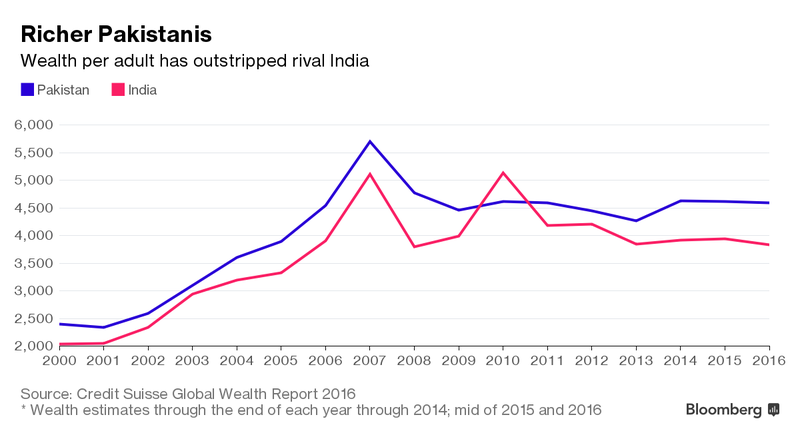 In 2016, India is the second most unequal economy after Russia. 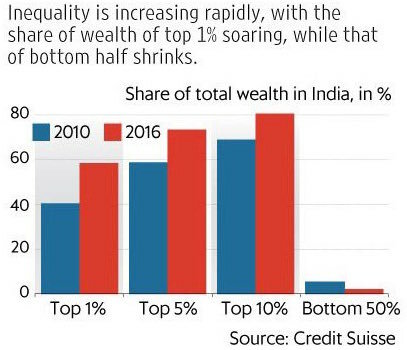 Inequality is fracturing our economy and the reality is that today 57 billionaires control 70% of India’s wealth. Even International Monetary Fund recently warned that India faces the social risk of growing inequality. As per IMF, India’s Gini coefficient rose to 51 by 2013, from 45 in 1990, mainly on account of rising inequality between urban and rural areas as well as within urban areas. India is currently too dependent on a regressive tax structure of indirect taxes and should move towards a more progressive taxation system that raises more tax revenues from the wealthy to fund more public expenditures on health and education to create a more equal opportunity country. India is a nation of caste and religion. It is a nation where caste is policy. Upper caste policy is to move upwards, while lower castes continually struggle in their lowly status. Everything that happens here is based on caste. At every stage of our life caste becomes important. We are unable to understand what is going on in the country if we disregard caste. We also see Justice T S Thakur, who delivered the court ruling, through the eyes of caste because the surname, Thakur, also represents a caste. When caste is so integral in our society how can we separate caste and religion - a solid foundation - from politics and elections? There are three main parties in India today: the Congress Party, the ruling Bharatiya Janata Party (BJP) and the Communist Party. The Congress and BJP are outwardly "secular" parties. The BJP promotes itself as the party for Hindus, and on caste issues it says it is "secular". However they choose to self-define, if we search further, we find that the soul of these parties is brahminical, i.e. belonging to the highest caste. The prominence of caste also applies to politics before India's independence. Priestly Brahmins who controlled the Bania caste - which had close business connections with them - have unjustly benefited from the new political reality, and that is why India's politics is called Brahmin-Bania politics. In the first days of this year, in a landmark ruling, the Supreme Court of India banned political candidates from seeking election on the basis of caste, religion and language. On the surface, this ruling seems to be appealing to secular voters, upholding the secular values of the constitution and implementing the principles of democracy. But it also seems to be contradicting a 1995 Supreme Court ruling which considered "Hindutva" (Hindu nationalism) and "Hinduism" a "way of life", rather than an ideology that belongs to a certain caste or religion. The court has been silent on reviewing the Hindutva issue. There has been praise from seculars on the ruling and respect for the judiciary has further increased among ordinary people. But while the verdict is indeed an important new development, there are still questions about its practicality because caste, like religion, remains an integral part of Indian society. Pakistan is among the frontier markets that are moving higher, but before jumping into the Global X MSCI Pakistan ETF (PAK), investors should evaluate the risks involved with a market such as Pakistan and the reasons Pakistani stocks are surging. PAK, the lone exchange trade fund (ETF) listed in the U.S. dedicated to Pakistani equities, is up 41.6% over the past year. That performance is more than 1,500 basis points ahead of a widely followed frontier markets index, in which Pakistan is one of the largest country weights. While frontier markets are often viewed as less desirable destinations for investors' capital than emerging markets, the reality is frontier economies have some advantages, including lower correlations to developed and emerging equities and, in some cases, less volatility. With those advantages in mind, investors mulling a position in PAK should note Pakistan's time as a frontier market is limited. Last year, index provider MSCI said Pakistan become part of the widely followed MSCI Emerging Markets Index in May. That announcement was made just seven years after Pakistan was promoted to frontier status from the standalone classification. It also makes Pakistan the first country since Qatar and the United Arab Emirates in 2014 to earn the frontier-to-emerging promotion. The promotion of Pakistan to emerging markets status means that active fund managers that benchmark to the MSCI Emerging Markets Index will have to buy Pakistani stocks to stay in-line with that index. With that promotion already widely known, Pakistani equities, including some of the 38 found in PAK, could already be soaring in anticipation of the frontier-to-emerging switch. Several members of the KSE 100, Pakistan's benchmark equity index, have more than doubled over the past six months, including some financial services names. That sector represents over a third of PAK's weight. Materials and energy stocks combine for 46% of the ETF's lineup. Although news of Pakistan's emerging markets promotion has been well telegraphed, Pakistani stocks still are not expensive. The KSE 100 trades at an earnings multiple of just under 11, a slight discount to the MSCI Emerging Markets Index. However, valuations on Pakistani stocks have been steadily rising since the third quarter. Investors willing to wager on a further upside for PAK can take heart in knowing that earnings growth for Pakistani stocks is outpacing the relatively modest increase in the KSE 100's price-to-earnings ratio while also topping earnings growth for the broader emerging markets universe. The launch of Tesco Label products at Alpha Supermarkets in Pakistan was announced by the British High Commissioner Thomas Drew and Limestone Private Limited at the British Deputy High Commission in Karachi. According to a statement issued by British Deputy High Commission here on Wednesday, the Tesco PLC is one of the world’s biggest companies and is a British multinational grocery and general merchandise retailer with stores in 12 countries across Asia and Europe. Tesco products will soon be available at Alpha Supermarkets in Pakistan including food and nonfood items in three categories: Tesco Goodness, Tesco Finest and Tesco Everyday. British High Commissioner to Pakistan, Thomas Drew, said on the occasion that ‘UK brands- especially those as big as Tesco’ have a real advantage in Pakistan, as British brands are so recognisable already to the many people in Pakistan who have visited the UK. This is a particularly important year for this to be happening in Pakistan, as we are celebrating 70 years of UK-Pakistan relations. While we will, of course, be remembering all the things that have linked us over the last 70 years, we are just as focused on the future of our relationship. At the heart of this will be increased trade between our two countries and I hope Tesco’s launch is just the start of a new era of British-Pakistani trade’. Poorer countries are catching up with richer countries, the poorer Chinese provinces are catching up with the richer ones, but in India the less developed States are not catching up; instead they are, on average, falling behind the richer States. Internationally, growth rates of per capita GDP widened at least since the 1820s with poorer countries growing slower than richer countries, leading to the basic divide between advanced and developing countries characterised as “Divergence, Big Time” by Prof. Lant Pritchett of Harvard University. However, since 1980 this long-term trend was reversed and poorer countries started catching up with richer ones. In stark contrast, there continues to be divergence within India or an aggravation of regional inequality. What is especially striking is how convergence has evolved over time. In the 1990s, convergence patterns were not dissimilar (Figure 2) across the world, China and India with either weak convergence or divergence. But things really changed for both the world and China in the 2000s; however they did not change for India. This was despite the promise that less developed States such as Bihar, Madhya Pradesh and Chhattisgarh had started improving their relative performance. But the data show that those developments were neither strong nor durable enough to change the underlying picture of divergence or growing inequality. The findings are similar when we use consumption per capita instead of GSDP per capita. Therefore, the evidence so far suggests that in India, catch-up remains elusive. The opposing results in India versus those in China and internationally pose a deep puzzle. Convergence happens essentially through trade and through mobility of factors of production. If a State/country is poor, the returns to capital must be high and should be able to attract capital and labour, thereby raising its productivity and enabling catch-up with richer States/countries. Trade, based on comparative advantage, is really a surrogate for the movement of underlying factors of production as economist Paul Samuelson pointed out early on. A less developed country that has abundant labour and scarce capital will export labour-intensive goods (a surrogate for exporting unskilled labour) and import capital-intensive goods (a surrogate for attracting capital). After getting ahead of India in equity market performance, Pakistan is getting ahead of India in another indicator: economic freedom ranking. That’s according to the recent 2017 Index of Economic Freedom ranking, which places Pakistan in 141st position and India at 143th. Pakistan’s lead over India in this ranking may not be big deal to most observers, as it is too narrow to be meaningful. Besides, both countries are ranking too close to the bottom. Still, Pakistan’s ranking has been consistently outperforming India's in recent years. Yes, to equity market investors. Gains in economic freedom ranking are usually associated with higher economic growth rates and higher equity markets. And the superior performance of Pakistan’s market over that of India’s might as well be a reflection of it. Simply put, while Pakistan is trying to place economic growth in the hands of entrepreneurs, India insists to place economic growth in the hands of government bureaucrats. That’s certainly good news for the future of Pakistan’s economy and equity markets. WEALTH and income inequality have risen sharply around the world in the past few decades, with data suggesting an acceleration in the trend over the recent past. This state of affairs has occurred despite massive economic prosperity having been generated over the same period of time, which has lifted millions around the globe out of extreme poverty. However, economic prosperity has not been shared equitably. According to Oxfam, “since 2015, the richest one per cent has owned more wealth than the rest of the planet”. Earlier this year, Oxfam reported that eight of the richest men in the world now owned the same amount of wealth as the poorest half of the world (3.6 billion people). Between 1988 and 2011, incomes of the poorest 10pc increased by just $65 per person — or less than $3 annually — compared to the incomes of the richest 1pc which grew by $11,800 per person, or 182 times as much. In the US, the situation with regards to income inequality is even more extreme. According to research by the French economist Thomas Picketty, over the last 30 years the growth in the incomes of the bottom 50pc has been zero, whereas incomes of the top 1pc have grown 300pc. The situation in Pakistan appears to have followed a similar trend. While the Planning Commission has stopped making public statistics on income inequality for the past few years, evidence suggests that the disparity between the richest and the poorest households has increased. According to the Household Integrated Economic Survey (HIES) 2015-16, the share of the top 20pc of households in overall income is nearly 45pc, while for the bottom 20pc the share is slightly less than 9pc — a multiple of 5 times. Inequality has broader dimensions beyond wealth or income. While looking at inequality through the prism of income or wealth distribution is instructive, it tells a less than complete story. For a country like Pakistan, the inequality in society is multidimensional — with deep structural as well as institutional roots. The poor and vulnerable are discriminated against, face exclusion and marginalisation in a structured and institutionalised manner. Hence, for a proper understanding of the issue, one has to map the broad areas and extent of ‘non-inclusion’ of citizens, not just the inequitable distribution of wealth/income. Governor Rajan was right in pointing out that India remains one of the largest poor countries on a per capita basis. He was right to stress the need to remain on the path to sustained growth. Median Incomes better depict the incomes of an average Indian than the mean incomes. In 2013, the median income at $ 616 was around 58 percent lower than the mean income or the per capita income at $1455. This is indeed a great cause of worry. Hence, the median income is the income of the average Indian. Given this, the median income is the right representation of the income of the average Indian. This is because the rich outliers (the Ambanis, the Adnanis, the Tatas and the Birlas) are taken into account. Data from World Bank shows that the top 10 percent of India’s population makes 30 percent of the total income. And this pushes up the per capita income. The trouble is that it is not so easy to find median income data in the Indian context. A survey carried out by Gallup in December 2013, put India’s median income at $616. Data from the World Bank shows that India’s per capita income during the same year was $1455.Hence, the median income was around 58 percent lower than the average income or the per capita income. And that is not a good sign at all. OK.. I agreed... It is true..But how we measure the industrial development between both Countries? What is the main sources of earning in Pakistan? And many more questions as par Pakistan. AJ: "But how we measure the industrial development between both Countries?" AJ: " What is the main sources of earning in Pakistan? " Pakistan's GDP comes from Services (55%), Manufacturing (25%) and agriculture (20%). In terms of employment, about 40% of Pakistanis work in agriculture vs 60% in India. Pakistan has lower inequality than India as measured by Gini coefficient. New research by French economists Lucas Chancel and Thomas Piketty, author of Capital, the 2013 bestselling book on capitalism and increasing inequality, clearly points to this conclusion. They studied household consumption surveys, federal accounts and income tax data from 1922 - when the tax was introduced in India - to 2014. The data shows that the share of national income accruing to the top 1% of wage earners is now at its highest level since Indians began paying income tax. The economists say the top 1% of the earners captured less than 21% of the total income in the late 1930s, before dropping to 6% in the early 1980s and rising to 22% today. India, in fact, comes out as a country with one of the highest increase in top 1% income share concentration over the past 30 years," they say. To be sure, India's economy has undergone a radical transformation over the last three decades. Up to the 1970s, India was a tightly regulated, straitlaced economy with socialist planning. Growth crawled (3.5% per year), development was weak and poverty endemic. Some easing of regulation, decline in tax rates and modest reforms led to growth picking up in the 1980s, trundling at around 5% a year. This was followed by some substantial reforms in the early 1990s after which the economy grew briskly, nudging close to double digits in the mid-2000s. Growth has slowed substantially since then, but India still remains one of the fastest-growing economies in the world. The ongoing slowdown - growth was 5.7% in the April-June quarter, the slowest pace in three years - largely triggered by feeble demand, a controversial cash ban, declining private investment and weak credit growth, is a cause for concern. And the need for fast-paced growth, according to Nobel Prize winning economist Amartya Sen, is "far from over since India, after two decades of rapid growth, is still one of the poorest countries in the world". From their latest work on income inequality, Lucas Chancel and Thomas Piketty contend that there has been a "sharp increase in wealth concentration from 1991 to 2012, particularly after 2002". Also, they conclude, India has only been really shining for the top 10% of the population - roughly 80 million people in 2014 - rather than the middle 40%. The economists plan to release the first World Inequality Report, produced by a network of more than 100 researchers in December, where they will compare India's inequality with other countries and suggest ways to tackle it. They agree that unequal growth over a period of time is not specific to India, but market economies are not bound to be unequal. India's case is striking in the fact that it is the country with the highest gap between the growth of the top 1% and that of the full population. Incomes of those at the very top have actually grown at a faster pace than in China. The economists contend that the growth strategy pursued by successive governments has led to a sharp increase in inequality. China also liberalised and opened up after 1978, and experienced a sharp income growth as well as a sharp rise in inequality. This rise was however stabilised in the 2000s and is currently at a lower level than India. In Russia, the move from a communist to a market economy was "swift and brutal" and today has a similar level of inequality to India. "This shows that there are different strategies to transit from a highly regulated economy to a liberalised one. In the arrays of possible pathways, India pursued a very unequal way but could probably have chosen another path," Dr Chancel told me. A further breakup of wealth among the top echelons reveals that 10% of the adult population has 73.3% of wealth, 5% has 64.1% of wealth, and 1% has 45.1% of wealth. In absolute numbers, the report says, as of mid-2017, 770,089,000 adult individuals have a wealth range of under USD 10,000, 60,116,000 have a wealth range between USD 10,000 and 100,000, 4,158,000 have wealth range between USD 100,000-1 million, and 245,000 individuals have wealth more than USD 1 million. Pointing out that “while wealth has been rising in India, not everyone has shared in this growth”, the report’s data show that India’s Gini index – an internationally recognized, most commonly used measure of inequality, with 100% representing maximal inequality – is found to be 83%. By comparison, Pakistan’s Gini index is 52.6%, Bangladesh’s 57.9%, Sri Lanka’s 66.5%, Nepal’s 67.3%, and China’s 78.9%. What is driving the growth story of India is more important than statistics. There is a self sustaining ecosystem driving indias economy and providing income to many. English and I.T knowledge is providing sustained demand from western economies for specialized and cheap labour and services in multiple sectors. This and gulf labour of 600 k indians is driving remittance income of over $90 billion per year. This in turn is giving flip to the import of chinese goods to over 50 billion per year. Which is driving consumer driven economy generating employment to many. Also the quantum of ppl involved is much higher compared to pakistan. A comparision is not feasible. If UP and Bihar are excluded from all calculation. The per capita and median income will jump to 3000$. If you compare bangladeshi taka vs pak rupees you can conclude pakistan is worse off to bangladesh. Dont compare in silos. Best wishes.